PANASONIC PV-D4744S DVD VCR Combo OmniVision 4 Head Hi-Fi Fully Tested & Working. Condition is Used. Shipped with USPS Priority Mail. This unit has been fully tested as working and is ready to use out of the box! Shipped Fast With Priority Mail! Let Me Know If You Have Any Questions! Thank You! (Compatible with : For Panasonic A75C3297 A75C2817 A75C2825 A75C2841 A75C2925 A75C3623 A75C3625. Only cooling function ). Up for sale is a Adult Owned Original Authentic Genuine DVD VCR Combo Player Of “PANASONIC DVD VCR Combo Player Recorder PV-D4733S With Remote And A/V Cables”. Fully functioning VCR/DVD combo player Don’t miss out! Panasonic DMR-ES46v DVD Video Recorder VHS VCR Combo HDMI 1080P with remote. Condition is Used works 100% Shipped with USPS Priority Mail. Battery: 2 X AAA Batteries (NOT included). Color: White. 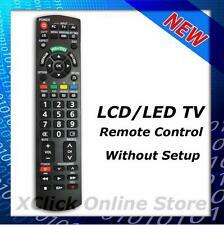 It covers all the functions of original remote. Due to light and screen difference, the item's color may be slightly different from the pictures. No programming is required, just fit the batteries in. The DV Input and multi-drive recording and playback let you record & play back DVD-Audio & Video, CD audio, CD-DA and MP3/JPEG discs. Compatible model:For N2QAYB000818 N2QAYB000816 N2QAYB000976 TH32A400A TH42A400A. 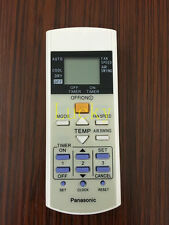 1 X Remote. We will try our best to reduce the risk of the custom duties. We haveour own factory, so we can provide item in competitive price and High quality. TheDMP-BDT280EB features built-in WiFi with a full web browser to allow easy access to the internet. Full HD 3D playback. Readable discs: Blu-ray: BD-ROM, Full HD 3D, BD-Video, BD-RE, BD-RE DL, BD-R, BD-R DL, BDAV, BDMV, DVD: DVD, DVD-R, DVD-R DL, DVD-RW, DVD-Video, CD: Audio CD, CD-R, CD-RW, CD-DA. For your consideration is a Panasonic PV-D4743S DVD/VCR combo unit. Easy to grip, small and compact size. If you do not receive our reply within 48 hours, pls. If you are satisfied with our service, pls. With High Resolution Audio, its sound quality is just as amazing as the visuals, and you can connect it to the internet via built-in Wi-Fi to open up the world of 4K streaming. The colours on your screen are given greater definition, bringing them to vivid life. This is for a Panasonic BD80 bluray player. I have one nice Panasonic DVD/VCR combo recorder DMR-ES46V for sale. It is in very good physical condition and working fine. It can play, record and finalize DVD-/ R fine!Also it can record from VCR to DVD. Panasonic Sa-Pt670 With Remote And new HDMI Cable. Tested.. Condition is Used. Comes as shown and will include 1 month warranty. Dvd and other functions works perfectly. Ship fast within 24 hours. Thanks for viewing. With High Resolution Audio, its sound quality is just as amazing as the visuals, and you can connect it to the internet via built-in Wi-Fi to open up the world of 4K streaming. Panasonic DP-UB820EBK 4K Ultra HD Blu-ray Player & 1m 4K Premium Certified HDMI Cable. Panasonic DMR-T3040 DVD Video Recorder that is used. It has been tested to power on and play only.NO recording has been done. NO Remote Included. Sold AS IS. Any known defects will be noted and pointed out. Dolby Digital decoder. Wide range of playback modes and features5-disc carousel DVD player. Digital theater / simulated surround sound. No remote or speakers. Panasonic DMR-ES46V VHS DVD recorder. - RCA AV cables. ITEM DETAILS. Panasonic DVD-RV65 DVD Player. Tested - Works Great. No programming needed, just put the batteries in and use. Warranty Service. If item is defective after 3 months, you can still send it back to us. We will send you a new one after receiving the defective item. Usage: Replace the battery, can be used directly. We will try our best to reduce the risk of the custom duties. Detail Image. Battery Type: 2x AAA battery( not included). Panasonic A120 DVD. Used with a signs of wear (see image) but still in prefect working order. Finally, to ensure that this recorder won't be affected by the analogue switch off, the DMR-EZ49 is fitted with a digital, Freeview tuner. This works with both the DVD and VCR, making it almost unique in being able to record digital Freeview channels on to VCR. PANASONIC DMR-EH595 (1126). Panasonic DMR-EH595 DVD/HDD Recorder. MIT 250 GB FESTPLATTE. JukeBox (schnelles kopieren von Musik CD's auf Festplatte). S Video-Ausgang (PAL/NTSC): AV1 (21-polig), S-Video-Ausgang (S-Buchse) 1 Vss, 75 ≠, Abschluss. Item has been tested and cleaned and is in great working order. The unit has slight wear markings to top. Great working order. Panasonic DMR-ES10 DVD Recorder Silver With Remote Video Plus RAM. Condition is Used. Dispatched with eBay delivery – Shutl 2-3 days. Condition is Used. Tested and Working Not all functions have been tested, therefore not guarantee can be offered on this item Please see pictures for cosmetic damage Dispatched with eBay delivery – Shutl 2-3 days. Panasonic 5 disc Dvd carousel. NOT blu-ray. Has component video (high def before 1080p), Optical digital for optimum digital surround sound, Analog Video, S video, and analog audio outputs. Comes with original manual, power cord, and the remote control. Works great. Can exchange dvds while watching one. Will also play mp3 encoded cds and dvds. Very minor scratches. No remote or original box is included. Panasonic 3D Full HD Blue Ray Disc Player. Condition is Used. Dispatched with eBay delivery – Shutl 2-3 days. Panasonic DMR-EH635 DVD HDD Recorder silber. DVD-Festplattenrecorder mit 250 GB Festplatte. Kopie von Festplatte auf DVDp>. Leichte Gebrauchsspuren können vorhanden sein (Produktbilder sind Beispielbilder) .